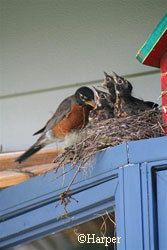 This robin raised a clutch of eggs in a nest on a front porch. Photo by Patti Harper. Q: If a person touches a bird’s nest, a baby bird or another baby animal, will that cause the adults to abandon their young because of human scent? A: This is essentially a myth, but one that no doubt started to help prevent people from disturbing wildlife. According to a 2007 article in Scientific American, this prevalent belief that the scent of humans leads to nest abandonment is “for the birds” and denies basic bird biology and “animal parents’ innate drive to nurture their broods.” To begin with, most birds can’t smell well. With the exception of some birds such as starlings or turkey vultures that are able to hone in on certain scents linked to their food sources, most birds have a limited sense of smell. The real issue is disturbance, not smell. For example, birds that have been flushed from a nest by humans or other predators do sometimes abandon their eggs or young, according to bird biologists who do nest surveys. It is never a good idea to disturb any wildlife – to protect both animals and people – and it most cases it is also illegal. The myth about human scent causing abandonment is also untrue for most other animals, including mammals. Baby animals that have been handled by biologists are usually reunited with their mothers, who do not appear bothered by the biologists’ scent on their young. Again, disturbance is the real problem. When handling baby animals, biologists must work quickly and carefully to minimize disturbance. Even so, the parents do sometimes fail to reunite with their young. For example, in a sheep study done by ADF&G biologists in the 1990s, three of the 62 lambs handled by biologists failed to reunite successfully with their mothers. While regrettable, biologists sometimes have no other way of obtaining necessary data and must handle young to complete their studies. 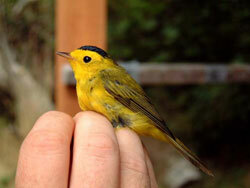 Songbirds like this warbler have no sense of smell and will not abandon a nest because of the smell of humans. The best rule of thumb if you find a baby bird or any animal infant is just to leave it alone. In most cases, the parents are nearby and may be waiting for you to leave the area. Touching animals can also result in diseases passing from wildlife to humans, or vice versa. However, if you do inadvertently happen to touch a bird’s egg or nest, rest assured that your scent alone won’t cause the parents to flee. Just leave the area as quickly and quietly as you can, and do what you can to minimize your disturbance.